Donal Walsh was a young Kerry teenager who gave great hope and inspiration to countless young people before dying from cancer in 2013. His mother Elma gave an inspirational talk to Leaving Certs, 5th years and 3rd Years earlier today on the the them of “LiveLife”. 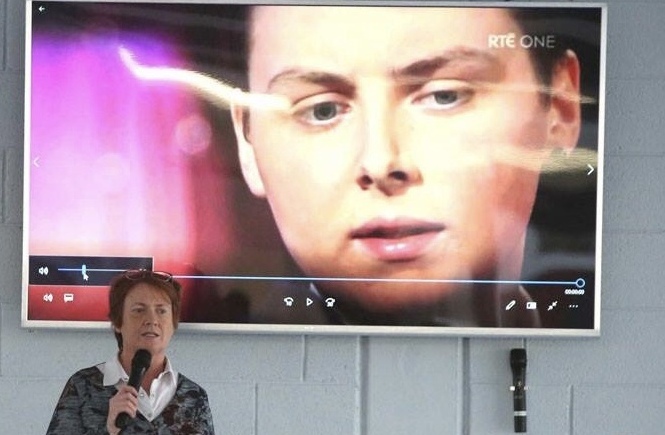 Elma & her husband Finbarr travel the length and breadth of Ireland talking to young people and encouraging them to live life to the full as Donal did in the face of insurmountable odds. After the talk students expressed their gratitude to Elma for making the 3 hour trip from Tralee to BCS to deliver an inspirational talk. They also made her a presentation of a bouquet of flowers and a signed ‘Thank You’ card. Knock Road, Ballyhaunis, Co. Mayo. Ballyhaunis Community School is a co-educational, multidemoninational school which caters for students of all abilities, preparing them for life. Ballyhaunis Community School provides an expansive curriculum which caters for the diverse skills, aptitudes and abilities of our pupils.